What a good idea all these Chicken Soup for the Soul books are! Instead of reading one book and hunting around for the most touching or uplifting passage, the Soup brigade of editors and writers scours the published world for brief excerpts, arranges them by category, and sells them by the kabillion. The spoon-size stories in Chicken Soup for the Couple's Soul hit the spot and warm the heart. Take the case of Dame Margot Fonteyn, the legendary dancer. She fell madly for Latin lover Roberto Arias at 18 in 1937, but history flung them apart. He recourted her 14 years later, after he'd become Panama's ambassador to the UN. Five assassin's bullets crippled him, but not their romance: he watched from the wings in a stretcher as she took 43 curtain calls in Romeo and Juliet. "I feel it's rather a fair division," she said of their love. "He thinks. I move. You see, I love him." Another love-triumphing-over-paralysis chapter reprints the most stunning passage of Christopher Reeve's Still Me. Whether single, separated or someone's spouse, everyone wants to find and keep this elusive thing called love. 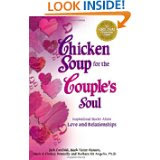 Bestselling author and foremost relationship expert Barbara De Angelis teams up as a co-author of Chicken Soup for the Couple's Soul, a collection of heartwarming stories about how real people discovered true love with the person of their dreams. With chapters on finding each other, intimacy, commitment, understanding, and overcoming obstacles, readers will find inspiration whether they're beginning a new relationship, hoping to work through a difficult one, or trying to recognize extraordinary moments in their lives. A sweet spoonful of this enchanting Chicken Soup collection will warm the hearts of the romantic readers everywhere.